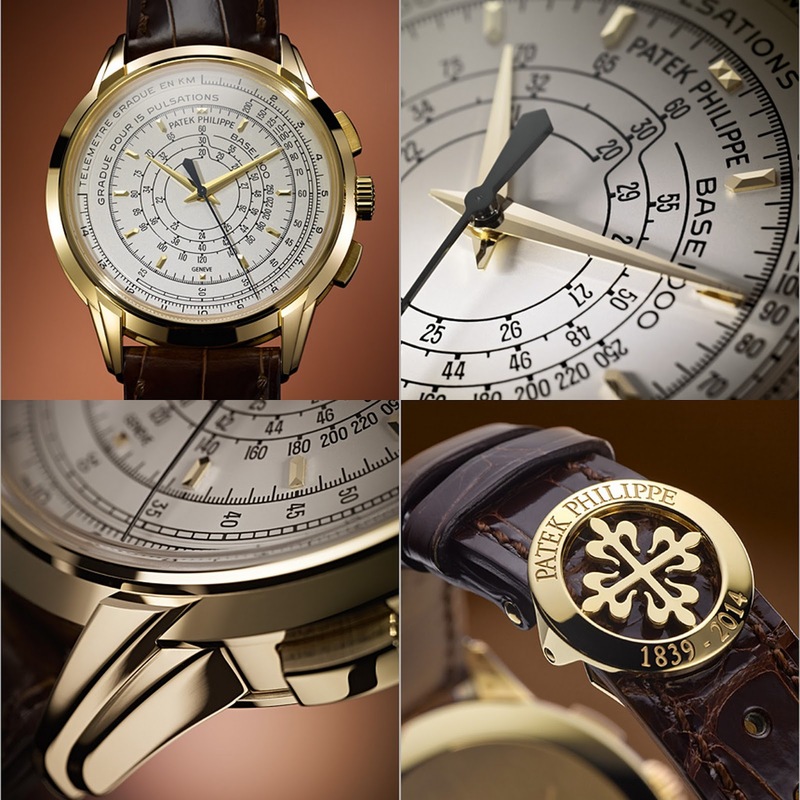 To mark its 175th anniversary Patek Philippe has created collection of limited edition timepieces, comprised of four models in several variations each, for both men and women, ranging from the US$2.3 million Grandmaster Chime grand complication to more affordable chronographs and world time watches, as well as the brand's first hour striker wristwatch. Here's a quick rundown of the 175th anniversary line-up. 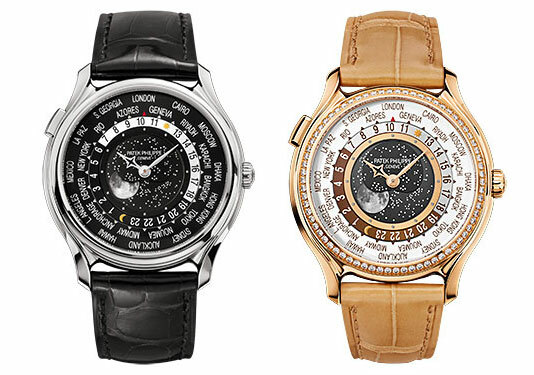 The Patek Philippe 175th anniversary collection is made up of four basic models, each presented in several variants, with the highlight being a grande and petite sonnerie. That is followed by the Chiming Jump Jour Ref. 5275 – which just might be the most interesting of the line-up – and the Multi-Scale Chronograph Refs. 5975 and 4675, with the last being the World Time Moon Refs. 5575 and 7175. Overall it is a fairly compact collection, but industry insiders indicate that the anniversary year lasts into 2015, which might mean more new timepieces. 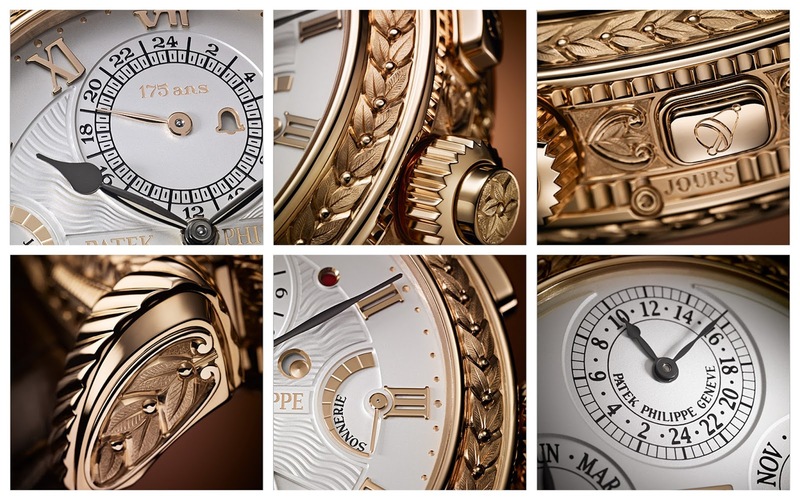 At the very top of the 175th anniversary collection is the Grandmaster Chime Ref. 5175R, a grande and petite sonnerie wristwatch with perpetual calendar, alarm and second time zone, coupled with novel features like a date repeater and time striking alarm. You can read about it in detail here. The second model in the anniversary range is the Chiming Jump Hour Ref. 5275P, a nod to the tonneau ref. 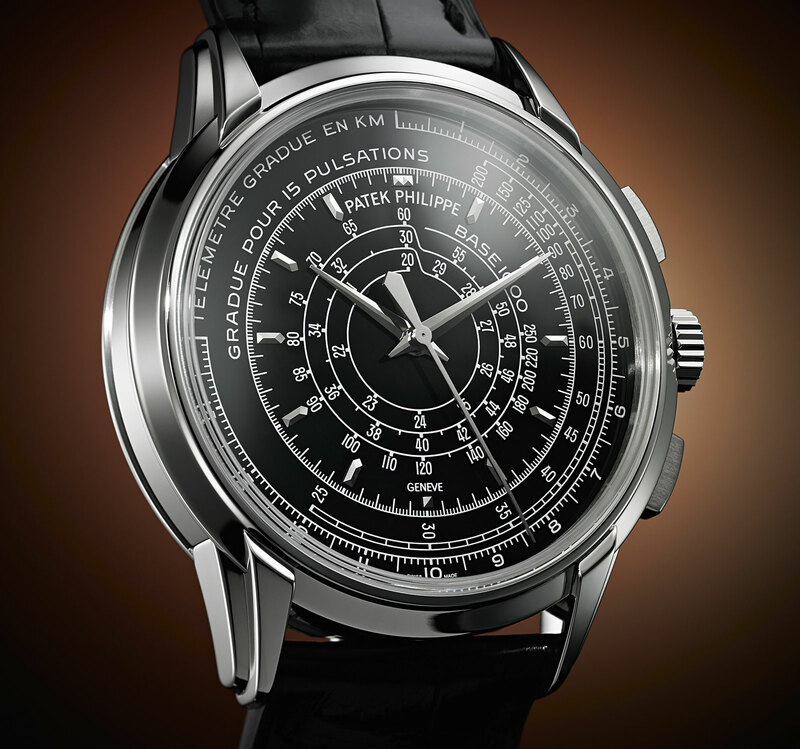 3969 jumping hours made for Patek Philippe’s 150th anniversary in 1989. 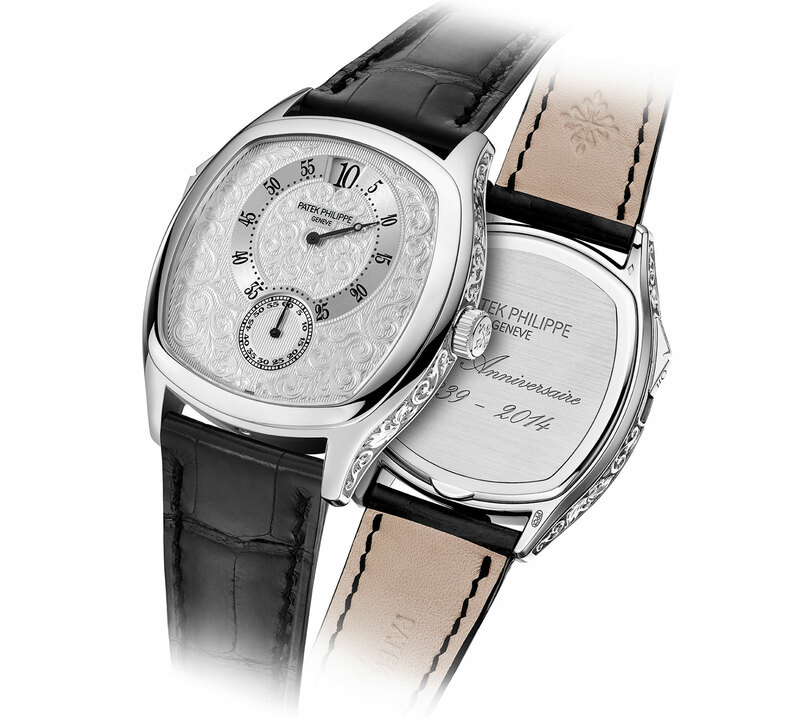 Presented in a tonneau-shaped platinum case, the ref. 5275 is possibly the most intriguing of the anniversary collection. The hours, minutes and seconds all jump instantaneously – the seconds hand is a dead-beat seconds, ticking in one second steps, while the minutes and hours jump one minute and one hour at a time. Additionally, at the top of each hour, the calibre 32-650 HGS PS strikes a single chime alongside the jumping hour. Notably, this movement uses Silinvar (silicon with an oxide outer layer) for a lever and gear for the jumping mechanism, the first time Patek Philippe is using the material outside of the escapement or balance assembly. 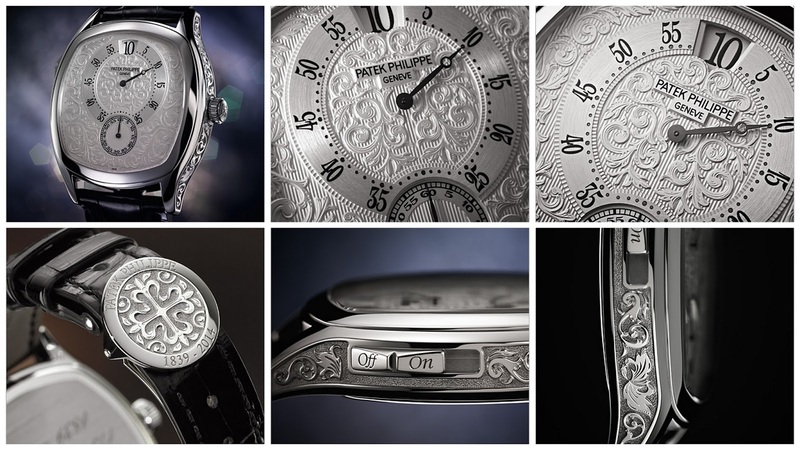 The platinum case measures 39.8 mm by 47.4 mm, with a hand-engraved floral motif on its sides that is also echoed on the solid gold dial. 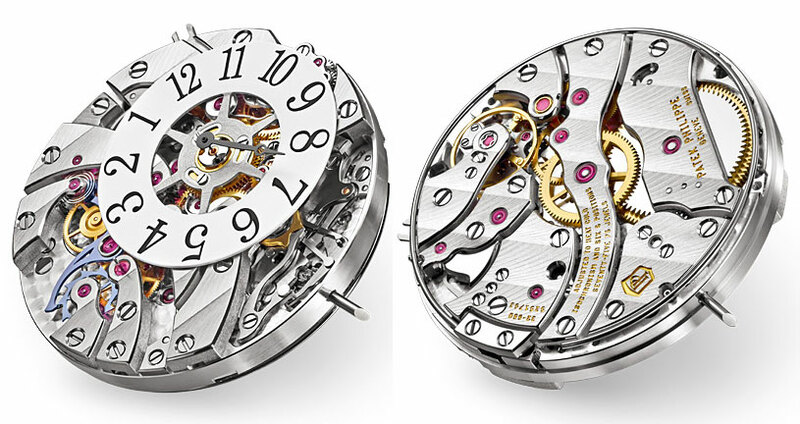 The Chiming Jump Hour is limited to 175 pieces with a price of 310,000 Swiss francs (~US$341,000). Third in the 175th anniversary collection is the Multi-Scale Chronograph, available as the ref. 5975 for men and the ref. 4675 for ladies. This is a chronograph with only an elapsed second hands in the centre of the dial, conceived to work with the various scales on the dial which allow for measuring different values. The scales on the dial are a pulsometer, intended for doctors or nurses to measure heartbeats; a tachymeter that allows for speed measurement of an object travelling one kilometre; and finally a telemeter, originally designed for military personnel to determine the distance of an artillery placement by using the time difference between the muzzle flash and sound. 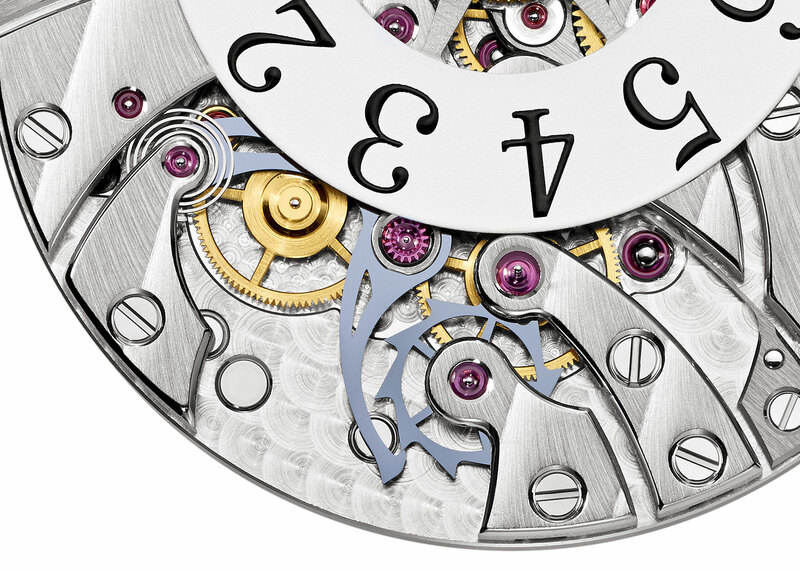 Inside is the calibre CH 28-520, a variant of the movement found in the Nautilus ref. 5990 and chronograph-annual calendar ref. 5960. 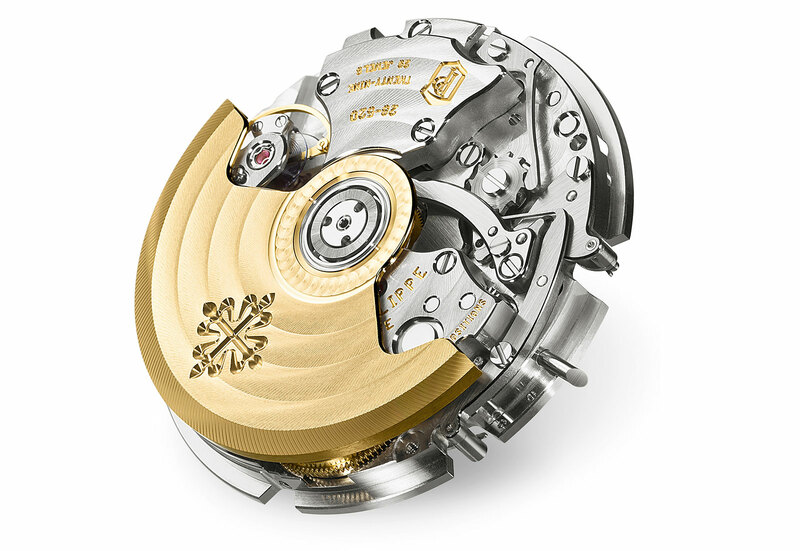 Because this movement uses a vertical clutch, the centre seconds can run continuously as a constant seconds hand since there is no detrimental effect on timekeeping, unlike the more traditional horizontal coupling. The stepped lugs of the Multi-Scale Chronograph are screwed to the case, allowing the case to be entirely disassembled for easier polishing during overhauls. The men’s version ref. 5975 has a 40 mm case, while the ladies ref. 4675 is 37 mm. The ref. 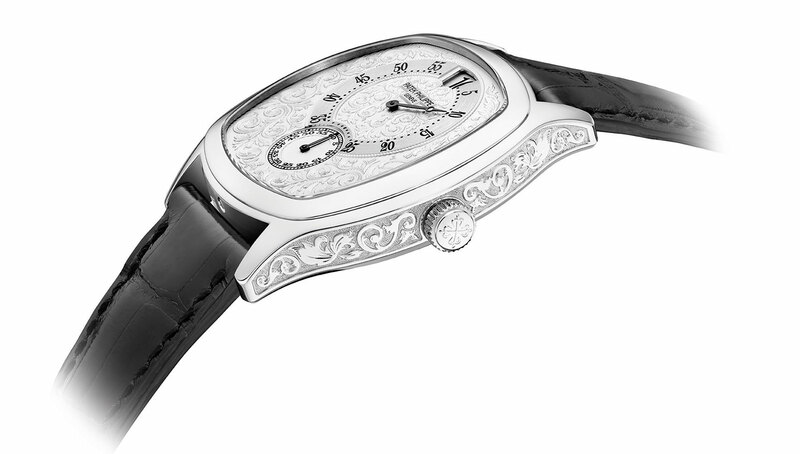 5975 is limited to 400 pieces each in yellow, rose and white gold, and another 100 pieces in platinum with a black dial. 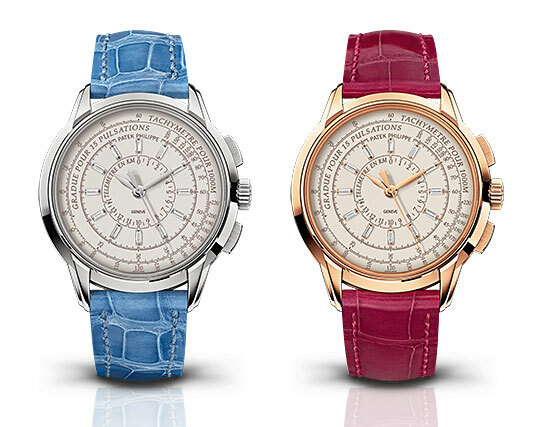 These will cost 55,000 Swiss francs in gold and 78,000 Swiss francs in platinum. The ladies ref. 4675 is limited to 150 watches each in rose or white gold, with baguette diamond hour markers, with a price of 55,000 Swiss francs each. 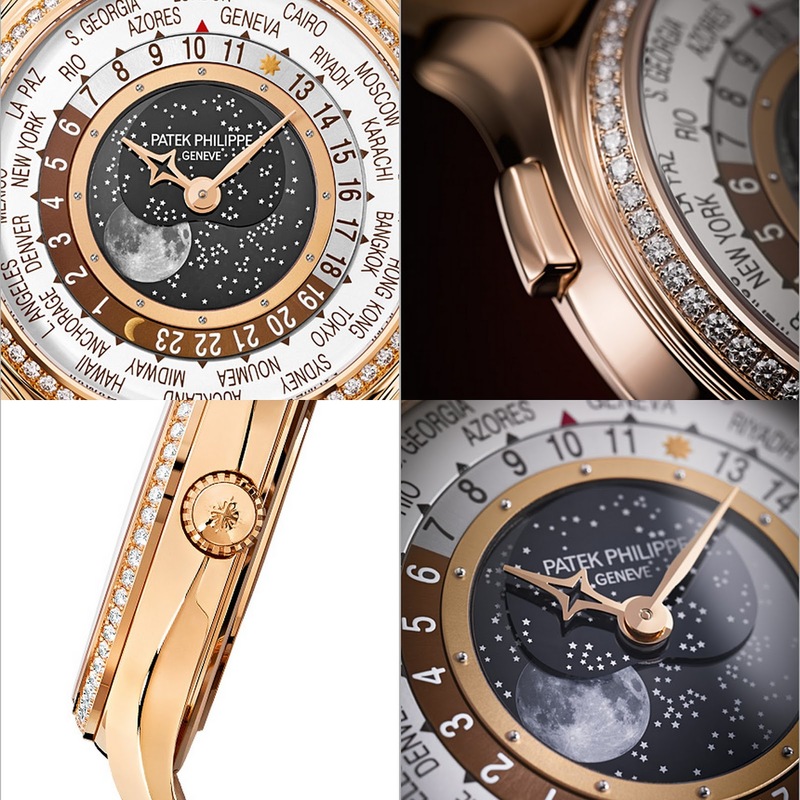 Last in the 175th anniversary quartet is the World Time Moon, with the ref. 5575 for men and the ref. 7175 for ladies. 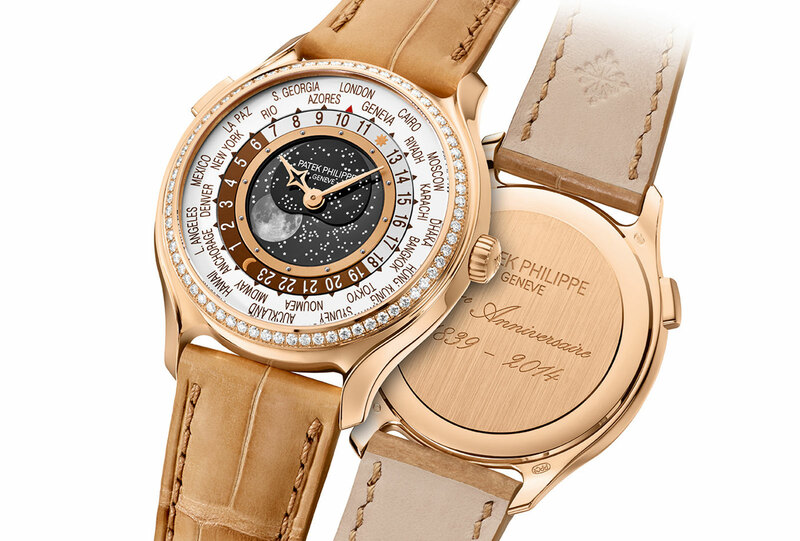 This combines Patek Philippe’s well known world time complication with an oversized moon phase display. Two glass discs form the centre of the dial, one showing the night sky and a realistic depiction of the moon, complete with craters and all; the other disc sits just above and is stationary, with an aperture that reveals the phase of the moon. 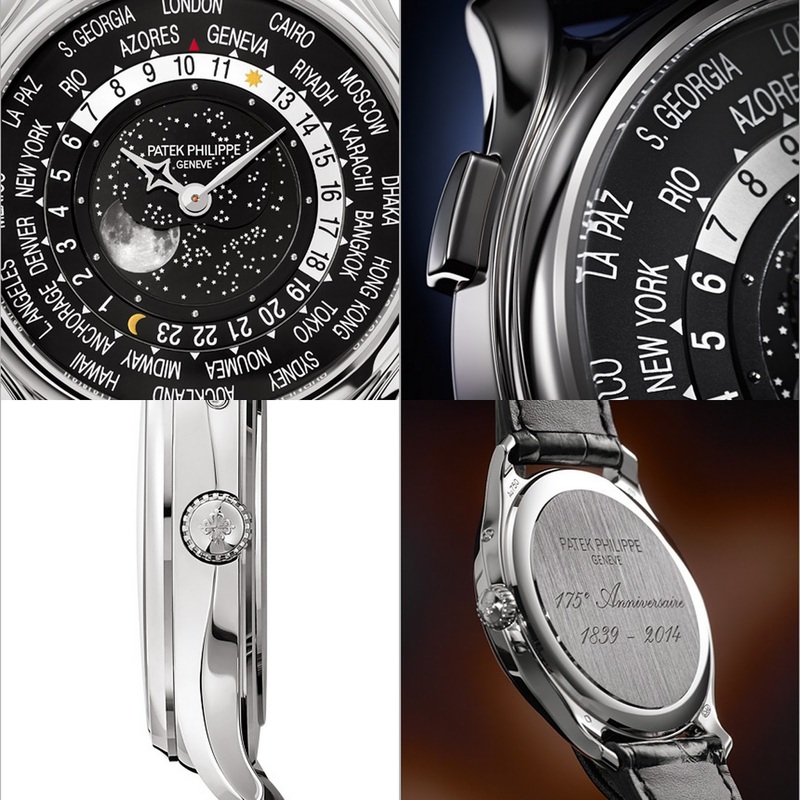 Both World Time Moon watches use the same calibre 240 HU LU. The ref. 5575 for men is limited to 1300 pieces, with a 39.8 mm white gold case and a price tag of 46,000 Swiss francs. 450 pieces of the ladies ref. 7175 will be made, with a 38 mm rose gold case and diamond-set bezel. This is priced at 50,000 Swiss francs. 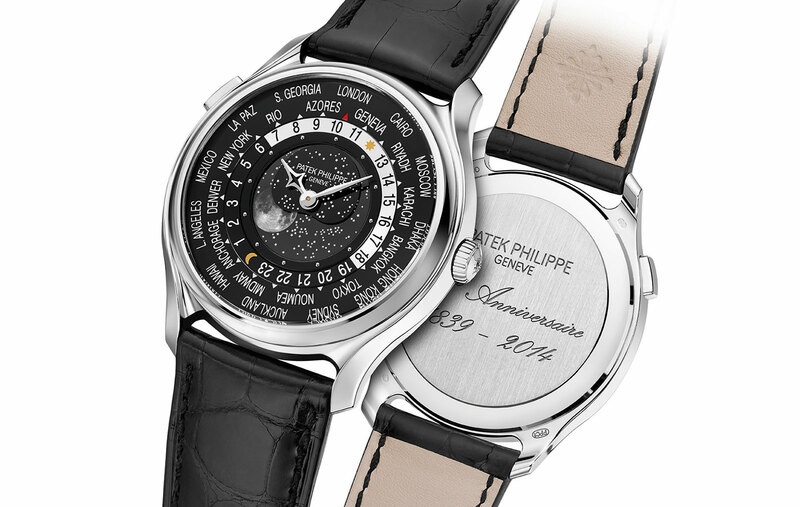 One of the more affordably priced - relatively speaking - limited editions in the Patek Philippe 175th anniversary collection is the Multi-Scale Chronograph, References 5975 and 4675. Styled like a vintage timepiece, it's a self-winding chronograph with a single seconds hand and three logarithmic scales to measure speed, distance and heartbeats.